DUG Insight User ManualFrequently Asked QuestionsFrequently Asked Questions HorizonsWhy is the amplitude value as shown by the cursor different than the horizon extracted value? The amplitude value displayed by the location of the cursor in section views, and the amplitude value extracted by horizon amplitude extraction, are fundamentally different. The cursor value displays the amplitude based on the nearest true sample value. The horizon amplitude extraction extracts the amplitude to the nearest 1000nth of a milli-second, based on the interpolation function. Nearest — Displays true amplitude sample values only. Quickest to render but provides the lowest quality of result. Bilinear — A simple linear interpolation to render the colour information and is slightly slower than the nearest neighbour method. Bicubic — Uses bicubic splines to interpolate your data. This provides the best output at the expense of performance. The following images demonstrate the effect of switching between Nearest and Bicubic interpolation methods. The images also include the wiggle traces, with no oversample (in Nearest), and oversampled (in Bicubic) for clearer understanding. Over sample controls the smoothness of the wiggles. 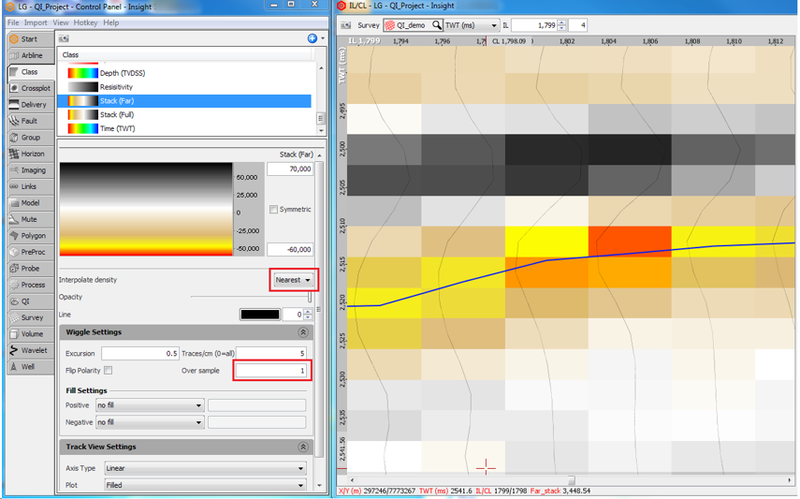 When set to 1, you will essentially see the raw trace. When set to 5, you will see something that resembles interpolation function. In both the images, a horizon is displayed, which was picked with Snap enabled. The snap function snaps the horizon to the highest amplitude value based on the interpolation function. The horizon extraction extracts the same value based on the interpolation function. Hence, the extracted value will almost certainly always be different to the nearest true sample value. It is important to note however that, even with the cursor value based on the interpolation function, unless you can place the mouse cursor on the EXACT same time as the horizon, you will still NEVER see the exact same value. Prev: How do I perform an amplitude extraction at different angles through the volumes? Next: How do I decimate an interpolated surface back to its original picked lines?